Still in dilemma which lighting to use? This infographic courtesy of Illustra Lighting (thank you guys!) hopefully ends that today! Only about 10% of the electricity used by an incandescent is converted to light, the remaining 90% is wasted as heat. 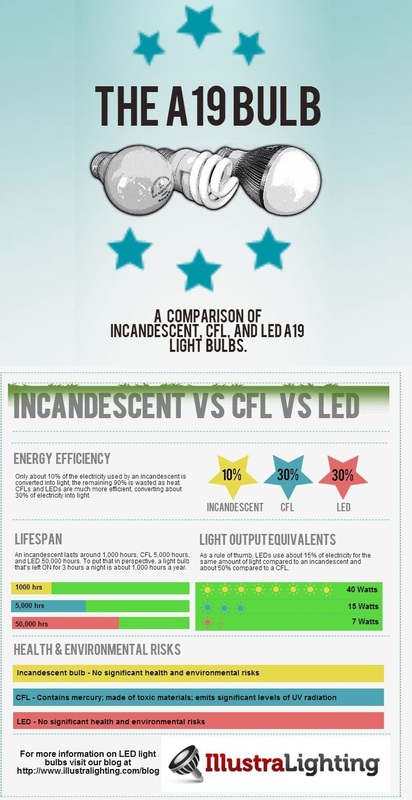 CFLs and LEDs are much more effecient, converting about 30% of electricity into light. An incandescent lasts about 1,000 hours, CFL 5,000 hours and LED 50,000 hours. To put that in perspective, a light bulb that's left ON for 3 hours a night is about 1,000 hours a year.